So today, I thought I would finally indulge those of you who are in constant puzzlement over how to tell the difference between two of the more common "sand stars" found throughout the Indo-Pacific! 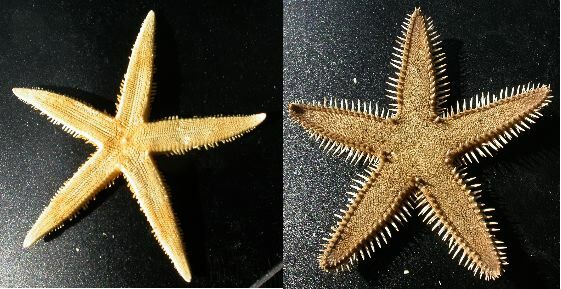 This is a surprisingly common question and its not just my colleagues who repeatedly ask me this -I frequently see these two species mistaken for one another in tropical aquarium and "shell collector" magazines, websites and so on..
Know Your Sand Stars! Convergence between Astropecten and Archaster? So, first, we are talking about TWO different species from two different families in two entirely separate orders. Astropecten in the Astropectinidae, Order Paxillosida (I will refer to the species Astropecten polyacanthus for simplicity's sake). I should add the caveat that there's just over 100 species of Astropecten throughout the world and a fair number of them are present in the tropical Indo-Pacific.. So, there may be SOME variation if you are looking at different species of Astropecten wherever you may be reading this.. 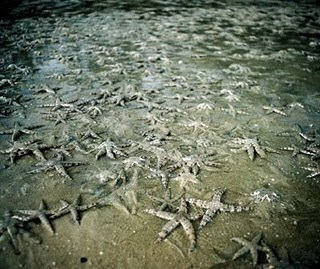 In spite of belonging to two completely different and distant groups of starfish, BOTH live in sandy bottoms with loose, unconsolidated sediment and possess the ability to dig and hide under that sand or sediment. As a consequence these taxa display a number of superficial similarities that are adaptations for each respective species to live buried in a sandy, muddy or otherwise unconsolidated bottom environment. In vertebrates, you would see this same kind of relationship-called convergent evolution between dolphins (which are mammals) and fish (which are not). Several consistent morphological features, which appear similar, but that arise in very separate evolutionary groups as adaptations to a particular way of life. In the case between dolphins and fish-the fins and smooth lemon drop shape are adaptations to life swimming through the water. 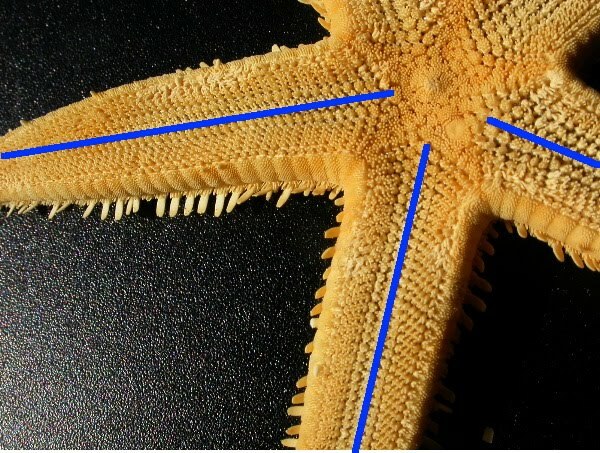 In the case of these starfish-the location of the spines and the certain similarities in body shape are independent adaptations to digging through sediment. So, How Do We Tell Them Apart? So-if there's one immediate and obvious character to use-its the distinctive central row of plates on each arm. Another immediately obvious difference between the two..
Archaster has actual suckered tube feet.... As seen here on this video.. This is as opposed to Astropecten which have pointed or knobby ends on their tube feet..
3. Body Shape and Spines on the Outline of the Body. Archaster only has big flat spines on the lower side of its body that flank the oral surface.. If there are spines on the upper surface, they are small and tiny.. Arm is more triangular. 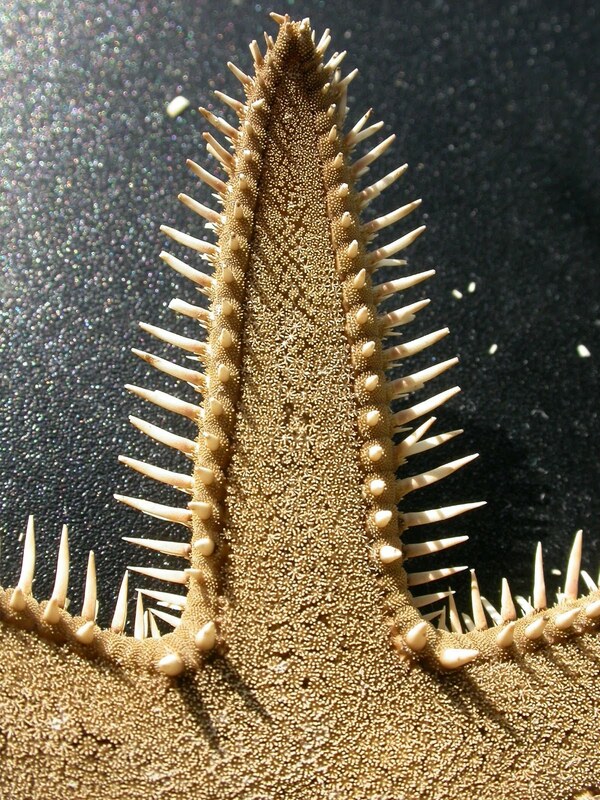 And many species of Astropecten will have a very prominent perimeter of spines around the body's edge. 4. The Spines are Different. Note that these spines are round and sharp rather than flat and blunt. In Archaster, the spines are flattened and blunt!! To the seasoned expert, there are actually MORE differences than this. But these were the characteristics that I thought were the easiest to tell apart for those who are simply observing the exterior. Thank you Mah for simple ways to tell them apart. Hi there! I'm currently *attempting* to write a paper on a specimen identical to the Archaster you have pictured multiple times here. Could you tell me the species name? I can't seem to find it. The widespread species of Archaster is A. typicus. There's another species-Archaster angulatus which is endemic to Australia. Most likely you've got the former. Good luck!